There are many techniques to mixing a song, whether mixing on a large console with all the best selection of vintage outboard gear, strictly in the computer with Pro Tools and all the latest state of the art toys, or a combination of both. 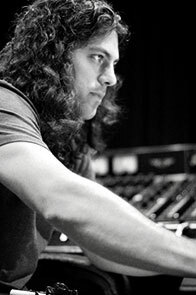 The point is that you want to make sure you select a mixing engineer that understands how to bring out the best in your music, has the skill set and experience to recognize what makes each song special, and confidently relies on techniques-not gear-to achieve the best sounds possible. My approach to mixing is to identify the key parts of the arrangement, the instruments and parts that play the most significant role in the song, and shine a spotlight on them. I strive to build each mix in a way that fits the style of music I’m working on in the most natural fashion, featuring all the key elements so that the music and sonic textures have the exact right feel and vibe to the listener. There are a few varieties in which I approach building a mix, but typically I start by dialing in the drum and bass sounds. Once I’ve got the drums and bass sounds put together I move on to the lead vocal (or whatever instrument is playing the role of the lead vocal). I do this because the lead vocal is the most up front element of the mix, and the part of the mix the carries the primary melody of the song. Incorporating the lead vocal in the mix as early as possible ensures that I carve out space in the arrangement for the vocal to sit in, and minimize the amount of instruments that compete for space in the mix. Next I begin working on other featured instruments that carry any hooks or important standout melodies to balance them into the mix. Finally, I balance in the last remaining instruments to complete the mix, and put on the final touches. Mixing a song requires extreme attention to detail, and you want to trust that your mixing engineer can bring out the best in the music you worked very hard to create before it’s handed off to the mastering engineer.